And so it ends.. or does it? But Dan Coffin, who organised the debate in the Barn Hall a week ago, replied with warm words for BEAM, the organisation that had campaigned for a council: “I'd like to say thank you to BEAM for standing up for something they believed in and bringing the idea of a Village Council to everyone. You should be proud of your significant commitment and efforts to drive forward something you believed in. And at the very least it has genuinely empowered residents and the community to think much harder about Bookham and keeping it great - I know that for a fact after speaking with lots of local Mums and Dads. Well done BEAM. This is not a defeat for BEAM. It is a defeat for Bookham. Time will tell how our services survive the continuing onslaught from County Hall. In the meantime, the organisation which opposed the proposal so bitterly now has to demonstrate that it can keep its word, something it signally failed to do in the run-up to the vote. BRA says it does everything a village council can do and does it for nothing. We, the voters, will hold you to that. As for the money the exercise has cost, it is true that in Turkey or North Korea it would be unlikely that the voters would have seen their hard-earned cash frittered away on finding out if they wanted a greater say in their own affairs. The Bugle is just glad to operate in a country where such meagre prodigality is justified as promoting democratic debate. And where the press is free to take its part. Today’s vote for or against a Village Council for Bookham is a once-in-a-generation opportunity to take serious control of our own affairs. Unless we residents seize it, this vote will be the last time we have the chance to take, in a secret ballot, any decision that directly affects Bookham, and only Bookham, as Bookham residents rather than as part of a county or district. Yes, we have to pay for the change to a Village Council. But if the working class area covered by the Stainland and District Community Association near Halifax, whom the Bugle met last year, can successfully campaign for a Parish Council*, what on earth is preventing Bookham from doing the same? Voluntary effort is entirely admirable. 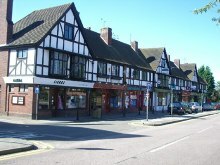 It has been the source of Bookham’s huge vitality for many years now. Voluntary effort is how this community defines itself. And long may it continue. There is no evidence whatever that voting yes for a Village Council would be anything other than beneficial for voluntarism here. But voluntarism is not enough. The fatal weakness of rule by unelected voluntary bodies is that we have no right to insist. Rightly, we cannot insist that a voluntary body carry out specific tasks within a certain time. Such a body has neither the people nor the money to carry the programme out. Voluntary bodies are self-directed. They do not set out a budgeted programme of actions for the next two or three years with a timetable for the completion of the different projects that will make a vital difference to Bookham’s future. We may be voters, but we have no control. One example: our Youth and Community Centre. At the recent debate in the Barn Hall, David Cox, who is responsible for the centre, described with deep feeling the excellent work that goes on there. Note, carefully, the County’s order of priorities: itself — and its coffers — first, Bookham second. As if to confirm the fragility of the youth centre’s position, Disability Challengers, which provides disabled and special needs children with space to play and make friends while their parents take a break, told parents yesterday in an email that its SCC has ended its funding. The charity runs a programme for 13 to 18-year-olds at Bookham Youth Centre. The Bugle learned of this last week but accepted an assurance from Conservative Councillor Clare Curran that Challengers’ funding had merely moved to another provider, YMCA East Surrey. 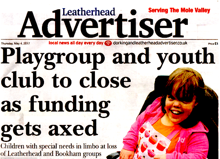 A report in this morning’s Leatherhead Advertiser, however, says the services have been axed, and any new arrangements have not yet become clear. But YMCA East Surrey now says that the Leatherhead Ads story is wrong and that these clubs will continue. No doubt the arrangements will become clearer once elections are out of the way. But the Bugle’s campaign for a Village Council was inspired by the strong conviction that we need to decide our own future rather than trust it to the tender mercies of Surrey County Council or any other outside body. Objectors may be right to demand that they do that which we already pay them to do and which they have failed to provide. Good luck with that. There’s a better way. Our campaign was also inspired by the equally strong conviction that any organisation which claims to speak for Bookham voters has to do what it says on the tin. It has to act openly. We should know who is making decisions and what their political or financial interests are in the matter in hand. They must take their decisions in public having found out what Bookham people want, not acting on their own whims and prejudices. We should insist that they declare any conflicts of interest. It is blindingly obvious, for example, that no unelected body should be allowed within 100 miles of expressing a view on any planning application that doesn’t directly affect its members. But this vote is not about the organisations, voluntary or otherwise, that already exist. It’s about the future of this community and its ability to carry on being a busy, pleasant, worthwhile place to live at the gateway to some of the loveliest countryside that exists in these islands. It faces deep challenges that, at the moment, we are not equipped to meet. Meet tomorrow’s challenges. Vote yes. * In February this year Calderdale Council gave the Stainland campaigners the go-ahead for a new Parish Council. I am a subscriber to the Bookham Residents Association. I’m not, and never have been, a member of BEAM or any other group promoting the idea of a village council. I just happen to agree with them. These are my reasons for supporting the idea. Decisions Close to Home - Decisions should always be taken as close as possible to the people affected by the decision. Today there is a gap between decisions made at my house and those that affect me made by Mole Valley District and Surrey County Councils - I think that can be filled by a Village Council. Localism – this is a variation of my first point: the 2010 – 2015 Coalition Government had a policy to push decision making down towards people. It is something the country had repeatedly asked for as a result of feeling distanced from decision making. The result was the Localism Bill, which has manifested itself in a number of ways: more devolution, new mayors and, in Bookham’s case, the ability for residents to initiate a Local Governance Review to consider the possibility of creating local village councils under various names. We should grasp such an opportunity and not be fearful of it. The areas that don’t take this up will find that decisions are made ever further from their own locality. ‘The Vanguard Effect’ – Bookham Vanguard did a great job coming up with the Neighbourhood Development Plan—please vote YES for this, even if you disagree with the idea of a Village Council. It generated more interest and involvement in local affairs than anything I’d seen before. I want ‘more Vanguard’ – with the ability to conduct widespread and ongoing consultation with the people of Bookham. This needs modest funding — accountable representation and consultation aren’t free — and a statutory body like Vanguard – a Village Council – to make it happen. An Uncertain Future for MVDC – Mole Valley District Council has an uncertain future in my view. Due to the general national funding situation, I foresee a merger with other district councils or even with Surrey County Council. Bookham’s voice will be fainter and fainter as ‘local’ decision-making moves further away. As budgets are cut and district or county councils are forced into a position where they can only fund statutory obligations — refuse collection, social care, education and so on — certain discretionary items, such as libraries with reasonable opening hours, youth clubs, verge mowing, will no longer be funded. If a community wants to do without these things, that is fine, but many of these things can’t be done by voluntary groups, and a Village Council does give the community the means to continue to support them if they so wish. Before I came to my decision to support a village council I did consider the potential downsides. Runaway spend – what if a village council goes on a spending spree? Affordability - some people are already struggling financially. Elected representatives – some village councils can’t find enough people to stand, so they end up co-opting people who are not elected. Bureaucracy – do we really want a third tier of government? Volunteer groups already do what a council would do – why should we fund another body to do what volunteer groups do already? I thought very carefully about these points and looked around the country at other parish or village councils for evidence of all of the above. My conclusion is that these objections, whilst valid concerns, either can be managed or just don’t represent what really happens. Spending - Parish and village councils that go on mad spending sprees just don’t exist. Firstly we don’t live in the days of ‘looney-left’ councils like Brent and Liverpool of the 1980s any more, and secondly, village councillors live in the communities they represent and wouldn't get away with things like that even if they wanted to. You can find sensationalised stories in the Telegraph or Mail about % increase of a precept (local tax) in a very few cases, but when you read the facts behind the story, there are always unusual and justifiable reasons for it. A village council can be set up with a constitution—“Standing Orders” is the term for councils I believe—that limits its powers, requiring consultation and voting on spending plans BEFORE they are committed to. Who can afford this? – I grew up on a council estate in Peterborough and money was tight. My wife and I now manage the financial affairs of my mother, my mother-in-law and a disabled friend in the village – all with low, fixed incomes - so I am very conscious of financial pressures some people face. Two things make me feel this is manageable. 1) Financial support (benefit) for those who struggle to pay Council Tax is, and remains, available. 2) The de facto ‘cap’ on the precept I mention above will keep the cost down. And remember, whatever a village council does will have to be costed and agreed up front. There won’t be any vanity projects. In particular two of the three people I help would willingly pay more if we could get some of the dangerous footpath areas (for wheelchair users) addressed that I’ve been trying, unsuccessfully, to get the County Council to address for four years now. Representation and consultation aren’t free. Elected representatives and taxation are part of what makes a civilised society – we work together and pool our resources for the greater good, even if there are some things we don’t agree on. Bookham isn’t Dibley! There are plenty of smart people in Bookham who would scrutinise the proposed council standing orders and plans before they were acted on. We could put any kind of ‘brake’ on expenditure, or a mandatory requirement to consult on a regular basis, into the council’s standing orders. I also think there would be enough people willing to stand as councillors to serve the village (by the way – councillors are NOT PAID, they are voluntary positions!). Bureaucracy – there is good bureaucracy and bad bureaucracy. Everyone knows what bad bureaucracy looks like, but most people forget the dictionary definition of bureaucracy or what it means. Bureaucracy is the machinery below a decision-making body (like a Council) that implements the decisions made by it. Good bureaucracy is efficient, lean and constantly looking to improve what it does, just like any good company, charity or other organisation. Again, I believe that Bookham has enough smart people to ensure any village council only operates good bureaucracy. Volunteer groups in and around Bookham are fantastic. They support the community in ways that governments can’t or won’t. But they can’t and don’t do many things that Bookham Vision and later Bookham Vanguard, with comprehensive consultations of Bookham residents, said we wanted. Voluntary groups do not have the resources or official status to consult widely, thoroughly and regularly, as Bookham Vision did and Bookham Vanguard did (both funded by the state by the way), to make sure things that local people want are being done. Bookham Residents Association (BRA) does many good things, but it does not represent residents in the way it claims to because it doesn’t consult widely and regularly. Its views are, therefore, those of a very small percentage of Bookham residents that sit on, or are close to, its committee. And you don’t have to just believe me on this point - the Bookham Vision survey (70 per cent response rate) asked questions about how residents felt that their views were represented. Only 17 per cent agreed with the statement “The BRA represents me on local issues”; and in the 18-34 bracket only 5 per cent agreed! These and other issues were raised at the debate organised in the Barn Hall last week by Bookham resident and, may we suggest, local hero Dan Coffin. A video of the platform section of the discussion is available here. Update: In response to Neil Walker's article, Mole Valley District Council’s Conservative leader Cllr Vivienne Michael, says: “Although, like other local authorities, we have experienced a reduction in the Revenue Support Grant from central government, this does not mean that we are contemplating merger with other councils, district or county. No such discussions have taken place and nor are they likely to in the foreseeable future. “MVDC’s Administration presented a balanced budget for 2017/18 and our Medium Term Financial Strategy includes measures to ensure the sustainability of our services as the council moves towards self-sufficiency in future years. “No front line services, statutory or discretionary, are being cut, indeed investment in some priority areas such as housing and family support, is increasing. Bugle Comment: The local press cuttings the Bugle has collected over recent years suggest that most local government cuts have been made by Surrey County Council rather than Mole Valley. The latest report by the Association for Public Service Excellence (APSE) notes that neighbourhood services have been the hardest hit of all local government services. They include maintaining local roads, providing parks, leisure centres and libraries, bin collections, recycling, and services that protect consumers like trading standards and environmental health. Spending on neighbourhood services in England fell £3.1bn or 13 per cent between 2010/11 and 2015/16 while spending on social care rose £2.2bn. The most deprived local authorities have seen the biggest fall in spending on neighbourhood services. Spending on neighbourhood services fell 22 per cent among the most deprived fifth of Local Councils over five years but only five per cent in better off areas. UK local government’s spending as a share of the economy is falling sharply. In 2010/11, UK local government current expenditure accounted for 8.4 per cent of the economy. By 2015/16, it had fallen to 6.7 per cent. By 2021/22, it will be down to 5.7 per cent - a 60 year low. Neighbourhood policing in Bookham has collapsed, according to the minutes of the Bookham Residents’ Association (BRA). As of Monday this week, the BRA website has posted no minutes for any of its meetings this year and only for seven from last year. The Bugle, however, has seen the minutes for the first three months of 2017. When the Bugle looked at the personnel of the neighbourhood policing team for Bookham and Fetcham on the Surrey Police website it found the ‘team’ comprises one person, PCSO Marion Hawkins. ‘Low crime figures deceptive’: The January minutes note a meeting between Police Inspector Richard Hamlyn, BRA chairman Peter Seaward and committee member Phil Harris about “a spate of issues” at various places in Bookham. At the February meeting a month later Harris said not only that he hadn’t seen any police in the village but that he “had tried to contact the 101 system but had experienced undue delays”. The March meeting noted that windows and cars had been damaged and that ‘wanted’ posters had been put up on lamp posts. Minutes during 2016 had mentioned inviting the Police Commissioner to the BRA meeting. By this meeting expectations had been lowered. The minutes note that Hamlin had agreed to attend an unspecified future BRA meeting “as a one-off”. There is no hint of any of these concerns in the latest, pre-election BRA newsletter (click here to download). Local policing rates only a passing mention, when in a shopping list of the BRA’s good works for the year, chairman Peter Seaward lists “talking to the Surrey Police Commissioner” . The Bugle may be mistaken, but it can find no record in any of the minutes for this year or last of any such conversation. Bookham isn’t dangerous. But neither is it safe, and you wonder why the Bookham Residents’ Association (BRA) insists on treating residents like children by failing to set out its concerns in its pre-election newsletter. Is it that it wants to show incumbent candidates, all Conservatives, in a good light? If so, so much for its pledge to be above party politics. A Leatherhead Advertiser Survey earlier this year says Ashtead, Dorking‘s Goodwyns Estate and North Leatherhead all have lower reported crime than Bookham. Over 200 of Bookham and Fetcham’s 857 reported crimes were anti-social behaviour. There were also 161 separate violent or sexual offences and well over 100 burglaries. So when did you last see a police officer? Bookham used to have two Police Community Support Officers (PCSOs). Now we have one (above) and she spends much of her time elsewhere in Mole Valley. Oddly, the number of officers in Surrey has been steady at over 1,900 for many years (figures, click here). They're just not in Bookham. And the number of Surrey PCSOs has almost halved, from over 200 in 2009 to 119 last year. The Bugle's close observation of the relationship between local police and the BRA is that it's too cosy by far. Where a Village or Parish Council might be asking searching questions about policing and insisting on answers, Surrey Police know that, if they have to cut back, Bookham's a good place to do it because they'll get an easy ride. It's easier, in the end, to plant trees. Meanwhile, local councils across the country now fund PCSOs under legislation that gives them powers to fight crime. Polegate in Sussex funds a PCSO for two days a week. Forest Row also part-funds a PCSO. Essex and Herts Police forces run schemes to help. Other local councils run schemes to help people mark bikes and other property against theft in addition to schemes usually run by Police crime prevention. Wonersh’s PC has installed traffic calming to tackle speeding. Why shouldn’t Bookham fund itself to do the same? Vote yes to a Village Council on May 4. At least that way we stand a chance. Law won’t cap VC precept – YOU will! A persistent objection to the proposed Village Council for Bookham has not just been that setting it up and running it will increase Council Tax (CT) bills. Residents also fear that the Village Council will be imposed by stealth. In other words, the promises of low CT rises that persuade residents to agree to the council will be followed by massive, uncapped increases in years ahead. An example is Bookham’s neighbour, Effingham, which recently increased its precept by 51 per cent. The concern is that, while local authorities, fire authorities, and Police and Crime Commissioners have been required to hold a referendum if they wish to increase council tax by more than an amount currently set at two per cent, no such cap applies to Parish Councils. The pro-Village Council campaign BEAM insists that this cannot happen. 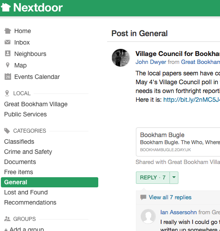 In a posting this week on the Nextdoor social network for Bookham, BEAM’s Nicola Reid points to a statement by Sajid Javid, the Secretary of State for Communities and Local Government, last December. In it, Javid said the government had considered capping Parish Council precepts but decided against it on practical grounds. Rising Parish Council taxes have caused concern. Last year BBC news found that over 5,000 Parish Councils planned to increase their precepts in the next year. Of those, about 3,600 planned an increase above 1.9 per cent. Almost as many, however, (3,535) planned to reduce or freeze their precepts as proposed to increase them. The BBC found that the average small-council share of the CT bill for a Band D house was 1.99 per cent. The highest proposed increase was ‘an eye-watering’ 1,200 per cent, at Thistleton in Rutland. But then, Thistleton’s 46 homes had paid £1.65 for the whole year in 2014 and the Parish Council needed to increase it to £21 to pay for an extra adult to accompany drivers on schools buses, to ensure safety and good behaviour. Even that precept was reduced again last April. Clarendon Park in Wiltshire increased its precept by 521 per cent: from £5 to £33, in this case to buy new notice boards and repair a vandalised bus shelter. Again, with that bill out of the way, this year’s precept has been reduced to cut the original, lower bill, by two-thirds. 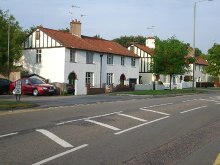 There are other cases of Parish Councils which, like Effingham, needed to raise large amounts to creating a fighting fund to combat unwanted development. 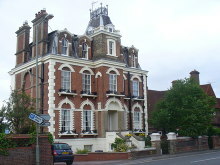 The largest cash rise in England was at Winchfield Parish Council in Hampshire. Winchfield, with 260 homes, increased its council tax bills by 436 per cent, from £19.98 to £87.13. The council told the BBC it had to fund planning consultants to help it challenge Hart District Council's plan for 5,000 new homes. She asks how, if a similar situation arose in Bookham, it would set up a similar fighting fund. At the moment there is no way of doing it. In his statement, Javid said the average Council Tax precept rise was 6.1 per cent. That, “does sound scary,” Reid concedes, but adds, “because the precept is a modest amount that 6 per cent might only amount to an additional, say, £3 per year for each household.” (As in the Winchfield case, above) BEAM has always given precept amounts in pounds and pence “because it's much more relevant and real than talking percentages." The 9,000 parish councils across the country would not still be operating if they were acting against the will of their residents and recklessly increasing spending without the consent of the electorate year after year. And Parish Councils can be disbanded in the same way they are set up: a petition to the district council followed by a Community Governance Review. BRA criticises residents for seeking better ways to protect Bookham’s future. The BRA broke its promise to present both sides of the case for a Village Council. Editor’s Note: Although this website supports the BE AMbitious (BEAM) campaign for a Village Council for Bookham, the articles published here are compiled without the approval or foreknowledge of anyone in the BEAM campaign except the editor, who takes sole responsibility both for the views expressed and any errors of fact that may have crept in. The Bookham Residents’ Association (BRA) has said repeatedly that a main reason for opposing a village council is that it would increase council tax. So let’s see what happened when, earlier this year, Surrey County Council proposed a 15 per cent increase in Council Tax to make up a yawning gap in the SCC budget. The BRA website has posted no minutes for any of its meetings so far this year in the run-up to the advisory poll on May 4. The Bugle, however, has seen the minutes for the first three months. So did the BRA think it was representing all residents’ views when it sat on its hands and implicitly approved the now-abandoned 15 per cent council tax rise? If it thought Bookham residents were in favour, how did it know this? Did nobody, not a single member of the committee, protest that that the rise was unacceptable and expect the BRA to use its undoubted influence to condemn the rise? And can we imagine what the BRA would have said if the increase had been proposed by, say, Surrey Liberal Democrats? Let’s look at the figures: The BRA says the Village Council would add £50 a year to the average council tax bill. That’s about two per cent on top of a typical Bookham band F household bill of £2,500 a year. The BRA resolutely opposes the Village Council largely because of this increase, even though a Village Council would be able to supply some of the services Surrey proposes to cut. And yet the BRA has nothing to say about Surrey’s proposed increase of 15 per cent, over seven times as much. No wonder they haven’t published the minutes. The Bookham Residents’ Association (BRA) committee has discussed sending tellers to polling stations on May 4 to talk to residents about to vote for or against a Village Council for Bookham. So far, the BRA website had posted no minutes for any of its meetings this year leading up to the advisory poll on May 4. The Bugle, however, has seen the minutes for the first three months of this year. There is no suggestion that that is what the BRA intended, and the idea had not been taken forward at the March meeting. 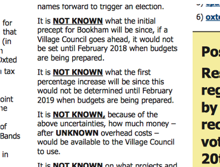 But the fact that the BRA committee even considered sending people to polling stations to talk to voters who are about to make a decision about the Village Council will strike some Bookham residents as going well beyond what they pay their BRA subs for. The January meeting also set aside £1,000 of residents’ money for a ‘no to a Village Council campaign’. The minutes did not reveal how the BRA committee had learned that that is what their members wanted them to do with their money. The meeting also suggested up to two public meetings to air the Village Council issue, but the following the month public meetings were ruled out without a reason being given. Who allowed these BEAM people to speak? The Bookham Residents’ Association (BRA) has twisted itself some quite bizarre logical knots over its opposition to the proposal to give Bookham its own Village Council. The Bugle has already written (here) about the most recent BRA newsletter. But there are further reasons why one BRA road steward took one look at the latest newsletter and had the backbone and moral courage to refuse to distribute it. Consider another article by John Howarth in the same issue (click here to download it). Under the headline “BRA under attack” Howarth turns his own attack on BEAM, the Village Council’s advocates. First, as John Howarth must know, his claim that Bookham residents “have already given their opinion” about whether to have a Village Council is simply untrue. This is because nobody, not even John Howarth, will know the opinion of Bookham residents on the Village Council proposal until after the advisory poll on May 4. To suggest otherwise is, put simply, dishonest. This, remember, is the poll that BEAM have campaigned for all along. The same poll, that the BRA has so resolutely opposed being held at all. So a group of residents had the effrontery to think a Village Council for Bookham was a good idea, and got together to mount a campaign to persuade others of its merits. And the point of their campaign was to hold a secret ballot to let Bookham residents decide for themselves about the issue rather than be told what was good for them. Disgraceful behaviour. On the other hand, since when did ordinary voters need to be elected to express their views about the future of the place where they live? Or to discuss it with others? Or to join with them to press for change when they see strong grounds for concern about Bookham’s future? Finally, there is quite a bit, when you think about it, that we don’t know about the BRA and its committees. What is their political affiliation? Do the sub-committee that vets planning applications declare any interest in planning matters. If so, who to? Sadly, the reality is that this is a committee of people with all the legal authority of a tennis club. The Bugle isn’t alone in believing BRA opposition has been totally disproportionate. BEAM held a poorly-attended evening information meeting last month at which Trevor Leggo, chief executive of the Sussex and Surrey Associations Of Local Councils (SSALC) remarked that, in all the decades he’d been involved in setting up and running parish councils, he had never encountered the bitter opposition that residents faced in Bookham. Thousands of other communities big and small, rich and poor, all over the country are happy to set up and run local councils. Why is the opposition here so fierce? The Bugle has always tried to pay the BRA credit for the excellent things it does for the benefit of all of us. These are not evil people, or anything like it. Further, it would be totally unreasonable for any group of residents to propose an important change in Bookham’s governance without their proposal coming under serious, detailed scrutiny. It is reasonable for the BRA committee to oppose the BEAM proposal if they wish. But like this? It is not reasonable either to mislead voters or lie about the case being made by their opponents. The BRA has not just failed to present the positive evidence for a Village Council, as it promised it would (click here to download its 2015 newsletter), but misrepresented both BEAM and those who support it. The BRA’s campaign sullies the BRA record, denying its members and others the evidence of the benefits flowing from a Parish Council and a forward-looking residents’ association working together, as happens in thousands of communities all over the country. Editor’s Note: Although this website supports the BE AMbitious (BEAM) campaign for a Village Council for Bookham, the articles published here are compiled without the approval or foreknowledge of anyone in the BEAM campaign except the editor, who takes sole responsibility for the views expressed. The Bugle ’s reporting of the Village Council issue has come under fire from some Bookham residents. Bookham voters have the chance to take part in an advisory poll on May 4 to say whether they favour the setting up of a Village Council for our community. The BRA's broken promise, Spring 2015. Posting their comments on the Nexdoor website this week, the residents complained that the Bugle’s reports were one-sided and that the debate had turned ‘nasty’ as a result. Ouch! Bookham resident John Sellers said that some of the people who had said they intended to go to the debate would make sure it was written up fairly. I soon learned that it didn’t even listen to its own road stewards on important planning matters, and that its independence of politics was a sham. The Bugle began because BRA meetings were closed to residents, it didn’t publish minutes of meetings, and its AGM was a Tory party rally, always held in the run-up to local elections, with a pep talk from the local Conservative MP. When these things were put right the Bugle site was suspended. If the BRA had kept its promise to present the cases for and against a Village Council fairly, that’s the way things would have stayed. The Bugle has always tried to pay the BRA credit for the excellent things it does for the benefit of all of us. But it believes the BRA’s campaign sullies that record, denying BRA members and others the even greater benefits certain to flow from a Parish Council and a forward-looking residents’ association working together. I frankly do not know the answer to that. My guess is that the BRA already thinks of itself as a Parish Council — BRA minutes mention this — so doesn’t want a real one cramping its style. Its committee think they’re entitled to run Bookham, with or without a secret ballot. What I do know is that the latest BRA newsletter is one of the most squalid documents I’ve ever read, for all the reasons set out elsewhere on this site. I know of one road steward who had the backbone and moral fortitude to take one look and refuse to distribute it to his neighbours. I’d say this to readers who say the Bugle’s coverage is one-sided: The front page of this site has prominent links to the important local websites, including the BRA’s; look for a BEAM link on the BRA website’s ‘links’ page. There isn’t one. Loads about Leatherhead. You’d think Bookham was a Leatherhead suburb, but no BEAM. How you would describe the BRA’s coverage of the Village Council proposal? And do you think reasonably well-informed residents who see the BRA telling lies and misrepresenting the case for a VC should sit on their hands and keep quiet? 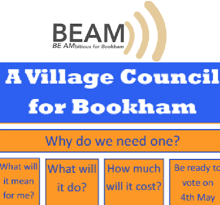 Disclaimer: This website supports the BE AMbitious (BEAM) campaign for a Village Council for Bookham. The articles published here, however, are compiled without the approval or foreknowledge of anyone in the BEAM campaign except the editor, who takes sole responsibility for the views expressed. Why is the BRA trying to deceive voters? The BRA’s alarmist nonsense about the effect of parish councils on voluntary work (A campaign that sullies the BRA's record, inside page) is not the only misinformation in its latest newsletter (click here to download). Not only have the BRA-led campaigners against the Village Council proposal broken its earlier promise to “identify [a Council’s] advantages and disadvantages” (page two of of its Spring 2015 newsletter — click here to download). They have also tried to mislead voters about the intentions of its proposers, BE AMbitious for Bookham (BEAM). Howarth presents these ‘unknowns’ as though they are a criticism of BEAM’s proposal, when they are the core of BEAM’s campaign. From day one BEAM has said that it is up to Bookham’s voters, not BEAM, to decide their own future, how much they want to spend on that future, and what they want to spend that money on. Don’t take The Bugle’s word for it: look at this page on BEAM’s website. When The Bugle met John Howarth, we asked him if he thought his BRA article was fair. “Every statement was accurate,” he replied. The Bugle reminded John Howarth that BEAM wasn’t presenting a manifesto, that its whole campaign was about allowing Bookham residents to decide how to fill in these gaps. How could it fill in these alleged ‘blanks’ before the electorate had made all the decisions? He merely repeated that the statements were accurate. Had he read any of the information on the BEAM website where this was set out? Yes, he said, adding he’d read “all of it”. This means that, while his statements may be accurate, they are also thoroughly deceitful. Here’s why. To come up with a series of statements about what we don’t know about the proposed Village Council is as valid as complaining that the BRA hasn’t housed a single Syrian refugee in the last five years. Accurate, but dishonest, because housing refugees isn’t the BRA’s business. BEAM is not standing for election. It has issued no manifesto. It wants Bookham’s future to be taken out of the hands of the unelected few and given back, not to BEAM, but to the community, in free, fair, fully informed elections held by secret ballot. The BRA wants to hang on to its unelected, unaccountable influence. BEAM wants you, the voters, to take charge. There are currently 10,000 parish councils in England, and over a hundred more are being formed. In most of them, residents’ associations and councils are working hand in hand to do things they couldn’t achieve on their own for the benefit of everyone. Just ask yourself why the BRA is so opposed to giving such a future here a fair hearing. If you’ve never voted before, break the habit and go to the polls on May 4. For more about the BRA campaign in the run-up to the vote, watch this space. Letters to the local press have mixed up the second two, saying that adopting the NDP will increase council tax. This is nonsense. The two NDP and Village Council issues are entirely unconnected. The NDP does no more or less than turn the work of the Bookham Vanguard Forum, which drew up the plan, into formal, enforceable planning policy. It attempts to give priority, for example, to affordable, smaller housing in the middle of the village over the four and five bedroom palaces that we have too many of. Whatever your views about the Village Council, please vote in favour of the NDP, to which BRA committee members made an important contribution. …unless we have a Village Council to take over local planning here in Bookham. And, for good measure, to take over the estimated £65,000 a year or more that will come in from local developers. Without a Village Council, Mole Valley gets control of that too. Mole Valley may spend that money in the Bookham area, but not necessarily on the things you want. ‘YES’ to the NDP ON MAY 4. The Bookham Residents’ Association (BRA) has done great things for Bookham. Its latest newsletter lists some of them: police liaison, renovating war memorials and cricket pavilions, bulb planting and so much else. Some of its committee members were also leading contributors to the drafting of the Neighbourhood Development Plan, the subject of a separate vote on May 4. A shame, then, that the newsletter short changes Bookham residents by misrepresenting the ‘dangers’ of a Village Council. Perhaps he should ask the people of Chilworth, whose village society, Chilworth2gether, works closely with two parish councils, Shalford and St Martha, on joint concerns. With the St Martha Parish Council, for example, it is fighting a plan to redevelop West Lodge, part of the local Gunpowder Mills, a scheduled ancient monument. It’s a small building and its main function is to provide toilets for locals and visitors. But they want to keep it, and the local residents association, its Village Society and Parish Council are working together to make sure they do. Chilworth’s conservation work on the mills is just the tip of a huge voluntary effort: they hold two barbecues a year to thank the volunteers! Two! Where is the evidence that having a Parish Council has damaged Chilworth’s voluntary spirit or changed it except for the better? Chilworth2gether’s annual report lists thriving a Brownie pack, a Mothers’ Union, a youth club... Not only did Chilworth2gether’s annual duck race make £2,000 for local work, it was able to write out a cheque for £150 to the local CofE infants’ school to thank it for the use of its car park. Or Peter Seaward could go to Blackheath Village, whose thriving Village Society raises more money for its work than the Wonersh Parish Council whose area it sits in. How, exactly, is that possible if parish councils conflict with local voluntarism? Christine Howard, chairman of the Surrey Hills Society and a woman with long experience of parish councils in our part of the world, told a recent BEAM information meeting that in Blackheath the Parish Council also part funded a much-needed traffic calming scheme. Wonersh PC's planning meetings, by the way, are open to the public, unlike those of the BRA. Yes, all these residents pay a bit more to have a Parish Council behind them, but they’re happy to, and so are hundreds of communities all over the country just like Bookham. One reason is that, whatever Peter Seaward chooses to believe, local councils reduce bureaucracy not add to it. Christine Howard also told us how, in West Sussex, problems with potholes, sign cleaning, overhanging vegetation, gutter spraying, graffiti removal, and much else could be remedied with just one call to the Parish Council rather than the 13 steps needed if they had to be reported to the County Council. The residents of Bookham are being short-changed. The newsletter notes how it is trying with others ‘to find money to improve and safeguard the Chrystie Rec pavilion’. A Parish Council could, if voters wanted, make that money available immediately. The Bugle has always tried to pay the BRA credit for the excellent things it does for the benefit of all of us. This campaign sullies that record, denying BRA members and others the even greater benefits certain to flow from a Parish Council and a forward-looking residents’ association working together. This site will publish more evidence of BRA misrepresentation shortly - watch this space. Anyone would think that the Bookham Residents’ Association mattered more than the future of Bookham itself. Most of you will be aware that polling day, May 4, includes a vote about whether Bookham should have its own Parish Council, to be called Bookham Village Council. Since then, the BRA has done the opposite, preferring to stifle just such a discussion. And God help anyone, even among their own number, who wants to give the council idea a fair chance. 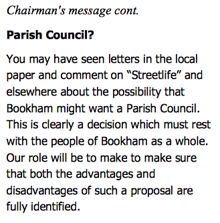 It’s as though no-one who advocates a Village Council for Bookham is entitled to a point of view. The BRA stalwarts insist that Bookham can only have either a residents’ association or a council. This ignores masses of evidence of PCs and RAs working together for the benefit of the community. This is what happens less than a mile away in Effingham. The only thing stopping such collaboration here is the BRA’s refusal to put Bookham before its own sense of importance. Bookham faces serious problems. There is too much litter (unless an election is due!). Speeding is merely one symptom of rising crime and disorder. Drug-dealing, once driven out by residents’ action, has returned. We've even had an outbreak of gun crime. Our youth services are being run down. Our library services are under threat. If we want potholes fixed, we have to wait until Surrey Highways can fit us in. And there is a strong case for a permanent home for the Meeting Place that once occupied the newsagents in Church Road and now has a temporary home in the Baptist Hall. But all the village’s leaders can think about is what will happen to the BRA! We deserve better. The BRA and its zealots should realise that the decision about a Village Council is not about them. It’s about our future and that of the children who live here. What is the BRA afraid of? 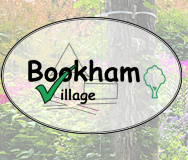 Within the last month a Bookham resident has issued a challenge to both Be Ambitious for Bookham (BEAM) and the Bookham Residents’ Association (BRA) to debate the pros and cons of installing a Village Council here. BEAM, a group of residents keen to promote a Village Council for Bookham*, jumped at this chance to set out how a Village Council could protect Bookham’s future, preserve its environment, rebuild the delapidated Youth and Community Centre, and at least make a serious attempt to tackle the flooding in East Street. The Bookham Community Association has stepped in to offer a hall for the debate, free of charge. We now learn the debate will be held on Thursday, April 27. The BRA took a week to decide to take part. What are they afraid of? Their main objection to Bookham Village Council is that it would add to residents’ council tax bills. It would, but by nothing like as much as they claim. On top of that they pile knee-jerk assertions about ‘extra layers of bureaucracy’, when a main reason parish councils exist and thrive all over the country is that they cut bureaucracy, not add to it. Worst of all, however, is the conceited nonsense that we don’t need a Parish Council because Bookham runs so well without one. A few minutes looking at the examples on the BEAM website should convince anyone that we could do so much better. * Interest declared: The editor of this website is a member of the BEAM team, but this site is independent of the BEAM campaign. No-one at BEAM was consulted about its content, nor did they know about it in advance or give it their approval. For the May 4 votes to be fair, voters have to be well informed about the decision they are taking. So it matters that Bookham residents have the chance to join an informed discussion about what a Parish Council might and might not be able to do for Bookham. How does the BRA justify spending its members’ money to defeat the proposal without first setting out the case for both sides, as it promised it would do? And how many of its own members did it consult before it plumped so decisively for opposition to the proposal? The whole point of BEAM’s campaign, on the other hand, has been to give every Bookham voter the chance to take part in a secret ballot, which happens on May 4. The BRA’s sluggish response to the demand for a public meeting is more of the same. It isn’t good enough. It never was. It’s time for a change. Vote YES on May 4. Editor John Dwyer writes: The Bugle website is now 11 years old. The last news item the Bugle covered, in April 2013, was to announce success for our campaign with Middlemead residents for a safe pedestrian crossing of the Lower Road for children crossing to the recreation ground. Now, having watched the village elders deal with the promise, for many of us—or as the Bookham Residents’ Association sees it, the threat—of a fully funded, properly elected Village Council, I have to say that the future of our village could hardly be in worse hands. It is not that anything awful will befall us. But Bookham will keep going downhill, looking scruffier and scruffier, its crime levels continuing to rise, and its services for youth and others falling away. This special edition of the bugle would not have been necessary if BRA chief enforcer Peter Seaward had kept his promise to put both sides of the case. The BRA likes to throw its weight about, but until those who insist on running Bookham begin to take as much interest in its future as in their own imagined standing in the community, we will be at the mercy of whatever Mole Valley or Surrey County Council choose to inflict on us. Everyone who reads this knows that local funding is dwindling to nothing. A Village Council gives you choices about your future. You pay more, yes, but not very much, and it provides at least a cushion against the whims and misery of central and local government. We don’t need a council, say the BRA. They don’t speak for the young people who could benefit from a youth centre that looked and felt as if young people were a valued part of the community. They don’t speak for those who feel threatened by streams of speeding traffic. They don’t speak for pedestrians who have to walk in the road because of parked cars and overgrown hedges on narrow, neglected pavements. They don’t speak for those who have lived and worked in parish councils elsewhere before moving here and know their value. They don’t speak for BRA subscribers who were never asked what they thought before the organisation spend their money on the campaign to defeat a Village Council for Bookham. You may have made your mind up about the Village Council already. Even so, please read the BEAM newsletter that will come through your letterbox in the next day or so. And please attend the public debate on Thursday April 27th.